Outside Hanuman temple (© 2010 Ramesh Avadhani). It was barely six on a Tuesday morning when I was woken up by a commotion on the street below. I went to the window. The sight was nothing extraordinary–a few people unloading vessels and cauldrons from a truck, but as time went by, things changed. A couple of men squatted on the patio of the mansion opposite, lit a gas stove, and started boiling dozens of potatoes in a large vessel. Another group got busy kneading wheat flour on a table. And a third started dicing chilies, tomatoes, onions and other vegetables. Apparently something special was cooking. Lucknow is in northern India and the capital of Uttar Pradesh, the largest state. It has a visibly larger population of Muslims than most other regions and for that reason perhaps there’s a greater mingling of Hindus and Muslims (along with Sikhs). 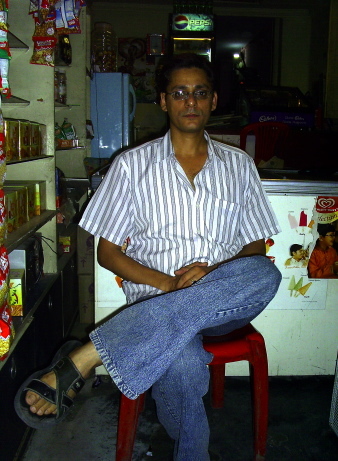 In several other cities and towns of India, Hindus and Muslims interact only occasionally, in matters relating to business or office work for example. As Pandey went on to explain the story behind the annual tradition of Big Tuesdays in Lucknow, I thought how nice it would be if only there were such celebrations all over the country. The story of Bada Mangal is this. Begum Janab-e-Alia, the second wife of the third Nawab of Oudh Kingdom (of which Lucknow was a part), Shuja-ud-Daulah (1753-1775 A.D.), dreamt of a divine presence commanding her to build a temple honoring Hanuman, the monkey god who is believed to be biggest devotee of Lord Ram. In the Indian epic, Ramayana, Hanuman and his army of thousands of monkeys help Lord Ram by building a bridge over the sea to Sri Lanka to rescue his wife Sita who was abducted by the demon Raavana. The dream pointed the Nawab’s wife to a specific site where an idol of Hanuman was buried. Accordingly, the begum ordered the excavation of the site and when the idol was found, made arrangements for transporting it back to Lucknow on an elephant. However, the elephant stopped in its tracks after some distance and refused to budge. The begum inferred this as another divine sign and ordered the erection of a temple at this spot-present day Aliganj. 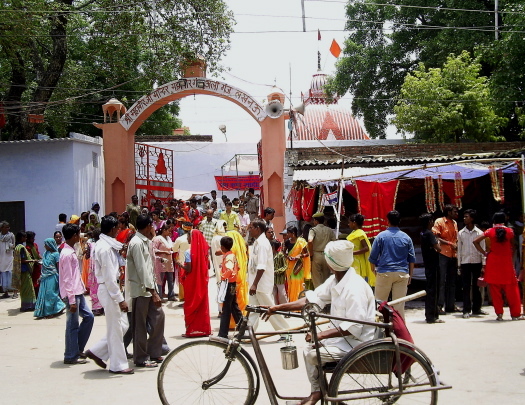 Since then, every year, people congregate at this oldest of Hanuman temples in Lucknow in large numbers on the four Tuesdays of Jyestha (which falls between May and June in the Hindu calendar). The belief is that Hanuman will answer all prayers during this period. Poories being fried in the hundreds (© 2010 Ramesh Avadhani). Well-off families all over the city prepare a feast for public consumption on these four Tuesdays. Virtually every street in the city erects a marquee or two for doling out the feast to passersby-whatever their faith. The feast comprises hot pooris (deep fried bread) and tandoori rotis (bread roasted in an earthen oven) along with potato curry and chutneys with a sprinkling of diced onion. The feast is rounded off by a glass of chilled juice of various flavors. In some places sweets are also distributed. 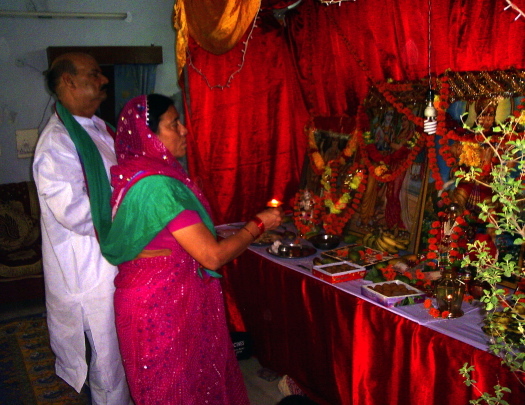 Mr. Tiwari and his wife perform pooja at home (© 2010 Ramesh Avadhani). He led me into a large hall where at one end colorful pictures of Hanuman, Ram and Sita were displayed and decorated with flowers and colored lights. A priest sat on the floor, reciting sacred verses from the Hanuman Chalisa. Relatives and friends trickled in and after greeting Mr Tiwari and his wife, sat down to join in the prayers. Later, someone picked up a dholak (Indian drum). Another picked up a cymbal and then the singing of religious songs commenced. The vibrant sounds were amplified through a mike and the entire neighborhood boomed with religious fervor. An hour of this and then it was ready for distribution of food to the general public. Outside, people had already gathered beneath the marquee where long tables were laden with food. Tiwari’s sons, aided by a few neighbors, went about serving the food with alacrity. It was clearly palpable on everyone’s faces, the joy in giving and receiving. At times, the crowds became rather un-manageable; such was the clamor for food. I saw many people, especially the younger lot, shoving plate after plate of the handout into plastic bags and then asking for more. But it was all taken in good spirit. Gurmeet Saluja believes the Bada Mangal celebrations could be organized in a better way (© 2010 Ramesh Avadhani). A point worth considering, I thought. 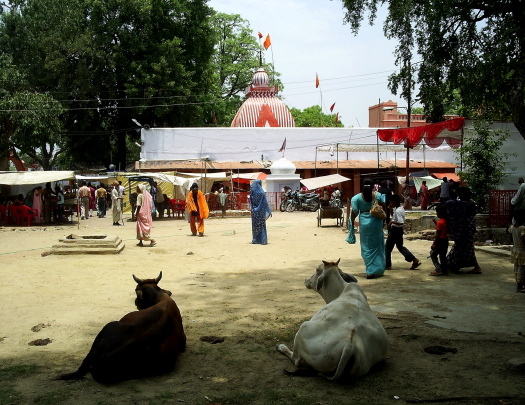 But I was now eager to make a trip to Aliganj to see the legendary Hanuman temple. I did this on the next Bada Mangal day. 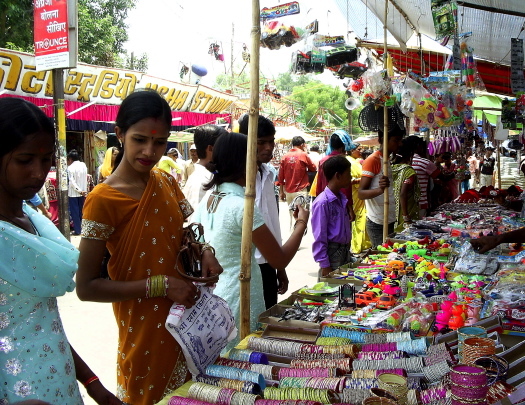 Aliganj is a crowded district where the Muslim presence is conspicuous. The place lies across the river Gomti which meanders through Lucknow. When I reached there it took me sometime to absorb the colors and smells pervading the air. It was like one big mela or village fair. The road leading to the temple was lined by dozens of hawkers. Curios, artifacts, jewelry, toys, snacks, beverages, games for children, even stalls that tattooed your name on your forearm or printed a design on your palms-they were all there. Despite the hot and humid day, men, women and children were happily drinking it all in as if this was the greatest picnic they were experiencing. 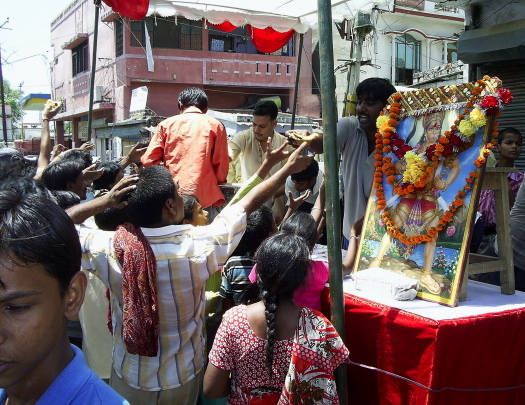 Pilgrims look at what is on offer at the Bada Mangal fair (© 2010 Ramesh Avadhani). 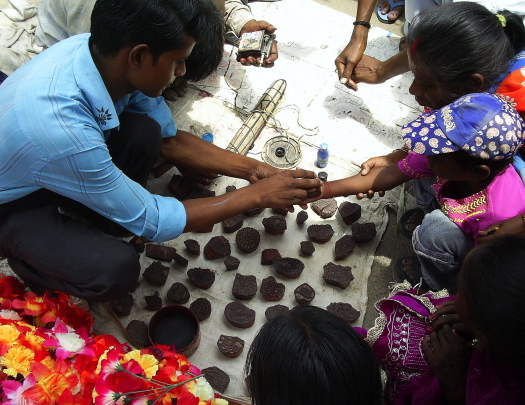 A child gets his hand imprinted with a design at the fair outside the Hanuman temple (© 2010 Ramesh Avadhani). 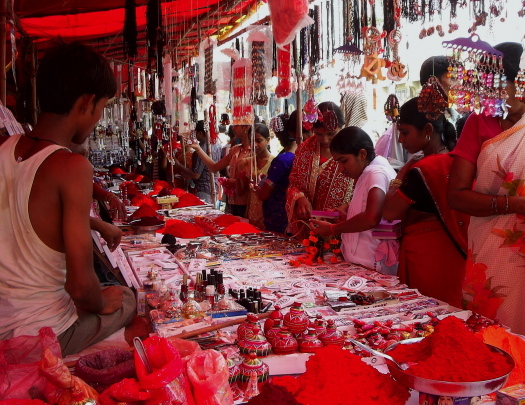 Pilgrims examine some trinkets at the Bada Mangal fair (© 2010 Ramesh Avadhani). The temple itself was much more crowded, but better organized in terms of queuing up to see the deity. Police constables kept a close watch on everyone, alert to any mischief or even terror attacks. Cameras were not allowed inside the temple so I could not photograph the shrine. But the fervor of the devotees lined up with offerings of sweets was something that I have seen perhaps only in one other place-the temple of Lord Venkateshwara on Tirumala Hill, the richest Hindu temple in the world. Someone called out, “Bolo, Hanuman ki Jai!” (Say, Hanuman is victorious) and everyone chorused “Jai!” The calls were repeated frequently as we inched closer and closer to the shrine and after some hesitation I joined in with much gusto. It was for me a long time since I shouted like that. And when I reached the shrine with a prayer on my lips, a priest smeared a dash of the sacred vermilion powder over my forehead, as a sign of Hanuman’s blessings. Perhaps my prayers will be answered, perhaps not. But I got to experience something special along with hundreds of devotees. A couple of mute spectators to the bada Mangal activities at Lord Hanuman’s temple in Aliganj, Lucknow (© 2010 Ramesh Avadhani).